There is that nothing reveals more about a person’s character than the way they treat those weaker than they are. While it might seem like the news is inundated with negative stories about people doing terrible things to animals, when we see stories about everyday people showing goodwill towards animals, even if it’s something simple like giving them a free lunch, it restores our faith that there are still many amazing humans out there. 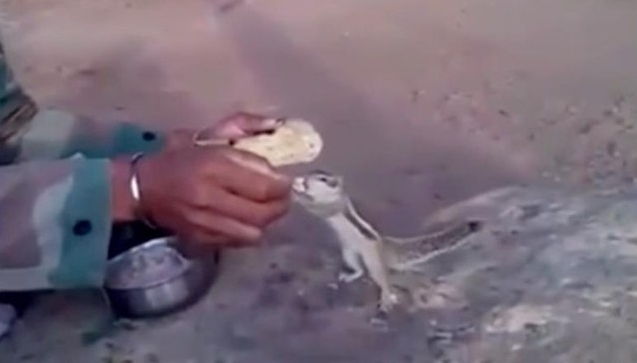 It is near impossible to watch this video of a kind man in the Indian Army interacting with a hungry squirrel without getting that warm and fuzzy feeling which reminds you people can be awesome. This man could’ve ignored the squirrel and had more food to himself, but instead he decided to take some of his valuable time to help out an animal that most people would outright ignore. Wouldn’t the world be a much better place if everyone was more like him? Responses to "Kind Soldier Stops to Share His Lunch With a Hungry Squirrel "